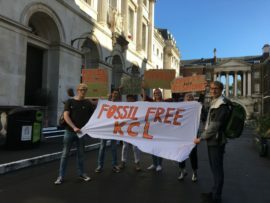 In late September, King’s College London announced that it would adopt a policy of phased fossil fuel divestment intended to reduce the university’s investments in companies involved with tar sands oil and thermal coal. According a university press release, the King’s College London Chairman’s Committee endorsed a new set of proposals which had been put forward by the university’s own Socially Responsible Investment Review Committee, made up of students and staff of the College. 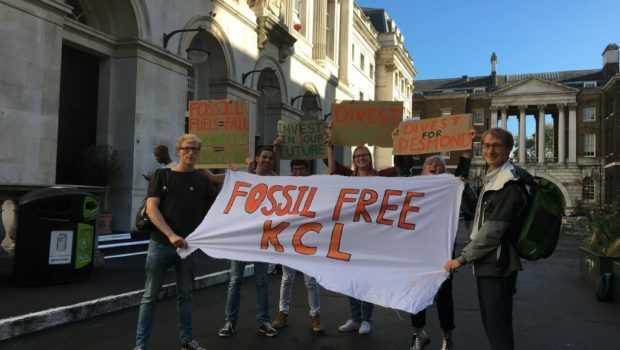 With an endowment in the range of £180 million, King’s College London will begin a phased divestment from any and all companies deriving more than 10% of their revenues from the “dirty” fossil fuels such as tar sands oil and thermal coal. “King’s is a force for good in the many diverse societies it serves and is committed to playing its part in aiding the vital transition to a low carbon economy,” said King’s College London President and Principal Edward Byrne AC. “We recognise that the overwhelming evidence suggests the world’s climate is changing, and that much of this change is due to our dependence on fossil fuels, that have also lifted billions of people out of poverty. This marks another significant divestment announcement in the long-running, global divestment campaign which has spread throughout business, industry, and education institutions. Numerous campaigns have been initiated around the world, backed by the Fossil Free initiative started by organization 350.org, which has specifically lent its weight to numerous university and college student groups pressuring their institutions to divest from fossil fuels.